Ethics is still a nascent discipline in India and many would agree it needs to be ingrained from the egg, in this case, in medical college itself. The editorial in this issue outlines how medical education can be better planned. 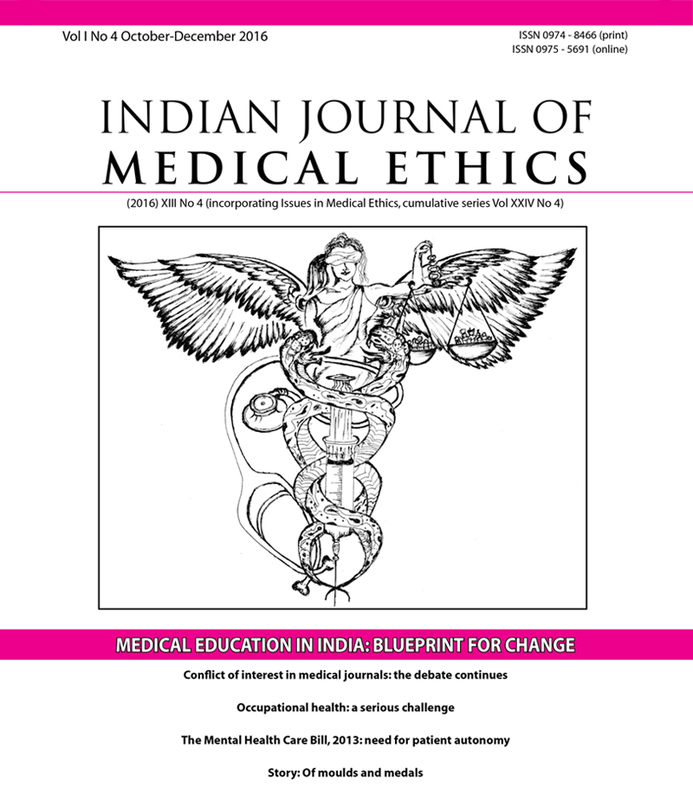 Other articles in this issue expose the lack of seriousness about occupational health and safety; describe how the ill treatment of medical students goes unreported, and how recent regulations have affected the working of ethics committees in India. New and improved laws like the new Mental Health Care Bill, are to be appreciated, but possible lacunae need to be explored, which is what a comment seeks to do. While standards of care should be upheld everywhere, serious challenges arise in under-served areas. Our authors present, in a comment and a letter, the desperate measures taken to compensate for acute shortages of blood supply and lack of expert advice in rural emergencies and ask whether they are unethical. In addition to interesting letters and book reviews, the discussion on commercial conflict of interest in journals continues in this issue; and a story expresses the unease of the conscientious physician in the face of abject loss and poverty. Cover credit: “Just saviour of souls”, courtesy P Ajith Kumar. The image of Justitia, Roman goddess of justice, overseeing medical care. Journal bias or author bias? Commercial conflict of interest and medical publication: What should the practising physician do about it? Does "supported decision-making'' in India's Mental Health Care Bill, 2013, measure up to the CRPD's standards? At last – a home grown ethics text! Manipulation of prescriptions by patients – what must a doctor do? What is wrong with the MCI? Should we share the management of acute life-threatening medical emergencies on the telephone? Time-bound promotions in Indian medical institutes: a mirage?